The ULF-28 is a contact exposure system with a CWX (Continuous Wave Xenon) lighting unit designed specifically for alternative photographers. This article will describe the AmerGraph ULF-28, review the features of its system, and compare its performance to other exposing systems. The ULF-28 is unique among current lighting units because it was designed as a system to work with different photographic processes, including both silver papers and alternative processes such as palladium and platinum printing. Because of the very great difference in sensitivity of these processes it has not been possible in the past to use the same exposing system for contact printing with silver and alternative processes. However, the ULF-28 includes two options that make this possible. The first is a filter drawer below the lamp that allows the use of various types of light attenuating and control filters, including a UV cut-off filter, ND filters and variable contrast filters. The use of a UV filter and two or three ND filters attenuates the light of the CWX bulb sufficiently to allow printing with contact speed silver papers such as AZO and Lodima Fine Art. The second option is the use of a secondary low wattage light for use with projection speed silver papers. The ULF-28 is thus an extremely versatile printing system that can be used with many different photographic processes, making it an ideal unit for persons who work with both silver papers and alternative processes. The ULF-28 in its basic configuration is a table top unit that is physically similar to the popular NuArc 26-1ks platemaker. It measures 30"H, 31"W and 30"D and has a maximum image area of 24” X 28”. Standard features include an auto process 20 channel "Scroll-Set" integrator with ten pre-programmed sequences and ten channels that can be programmed by the operator, a vacuum frame with heavy duty vacuum pump, and a 1200 watt Continuous Wave Xenon exposing system. The unit is available in either 120v, 60hz, 15a, or with other electronics, 220v for example. Options include a floor stand system, light shield curtain, vacuum delay feature, and UV and light attenuator filters. For further details go to www.amergraph.com. The primary light source of the ULF-28 is a 1200 watt CWX (Continuous Wave Xenon) bulb. The major advantages of the CWX over the metal halide bulb used in many UV printing sources are, 1) reduced ramp-up, meaning the unit gives full radiation very shortly after it is turned on, and 2) immediate re-strike capability after shut-down. The CWX also gives very fast printing speeds, a feature that will be highly appreciated by alternative printers. My controlled comparison testing of the ULF-28 and a bank of BL tubes showed that the ULF-28 prints on average more than 2 full stops faster than the BL tube bank. For example, in contact printing in palladium a Stouffer TP45 transmission step wedge the time needed for Dmax with the ULF-28 was about 60 seconds, and for the bank of BL tubes, more than four minutes. Tests with a number of different alternative processes show that on average the ULF-28 prints about 2.5 stops faster than my bank of BL tubes. In order to evaluate the performance of the ULF-28 tests were made with several alternative processes (cyanotype, kallitype, palladium, and Vandyke), and with AZO, a silver chloride paper designed for contact printing. The unit I tested was not equipped with the secondary low wattage lighting source so I was not able to test projection type silver papers. The major questions I sought to answer in my testing of the ULF-28 were the following. A. How much fall-off in illumination is there from the center to the far corners of the 24” X 28” image area? B. How uniform are the results when printing multiple copies of an image? C. How does the printing speed of the unit compare to that of other light sources used for printing with alternative processes? 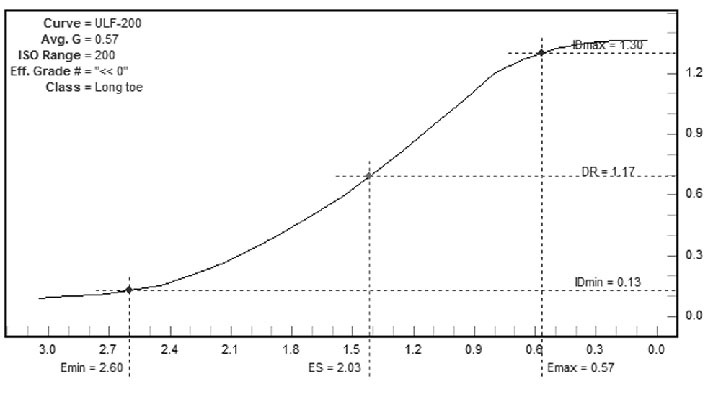 D. How does the SPD characteristics of the unit influence curve shape with alternative processes and with AZO? All of the testing, unless otherwise specified, was carried out by contact printing a Stouffer TP 45 transmission step wedge to papers coated for the various processes. Units of exposure, as determined by a light integrator, are specified as the measuring standard for both the ULF-28 and my bank of BL tubes. However, it is important to note that the light integrators of both units were calibrated so that one unit and one second are approximately the same. For testing of the alternative processes (cyaonotype, kallitype, palladium and vandyke) I used COT 320, a paper highly regarded by most alternative printers. However, I also ran a few control tests with another paper, Stonhenge, to verify that the results with the printing source were consistent across the various processes. All of the direct comparison tests were made side-by-side in the same room with identical temperature and relative humidity. All samples were single coated and air-dried for 15 minutes before exposure, with drying accelerated by the use of a small fan placed about four feet from the coated material. I developed all of the silver tests in Ansco 130, diluted 1:2. From previous tests with this formula I know it to be an excellent all-around developer for both AZO and VC silver papers. The silver step wedge prints were not toned since I did not want to introduce this variable into the testing. A. Tests for light fall-off from the center to the corners of the 24”X28” printing area. For this test I used AZO #2 paper. Light attenuation was via the accessory UV filter, plus three ND .9 filters. With these conditions exposure was 28 seconds, using the pre-programmed Preset #4. For this test I contact printed five strips of AZO #2 with one exposure, using four Stouffer #T2115 step transmission wedges, placing each at the far corners of the image area, with Step #1 facing out. Development was in Ansco 1:2 for two minutes, followed by a stop bath of fifteen seconds, and fixing for five minutes in TF-3. The step wedge prints were allowed to air dry, then the curves were read with an X-Rite 810 and plotted using Phil Davis’ WinPlotter program. Two film curves are reproduced below, one from an exposure made at the center of the printing area, the other from an exposure made at the far corner. I only include one edge curve because all four were essentially identical. From the plots you will see that the speed point on the center plot is located at about 1.58, and at 1.45 on the edge plot. The difference of log 0.13 is just slightly more than 1/3. This is really excellent performance over such a large printing area. The very even illumination over the entire printing area is achieved by the use of a very high reflectance hood located around the lamp. I repeated the center to edge comparison tests with Pt./Pd. and the results were very similar. However, because of the slight inconsistencies of hand coating the results were not quite as consistent as with AZO and I don’t believe there is any reason to include them here. One of the most important characteristics of a photographic printing system is consistency in exposure. The highest degree of precision is provided by light integrators, which samples the amount of light radiated by the light source at a given spot, and measures it in units, analogous to the way a water meter measures the amount of water that passes through the system. The ULF-28 has a high precision integrator that measures exposures from 1 to 999 units. Initial calibration of my unit was such that one unit equals approximately one second. 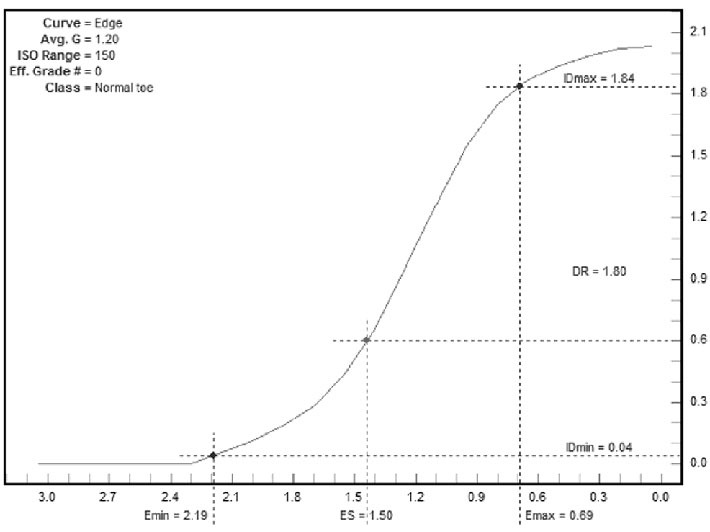 As bulbs age the amount of radiation they produce falls, so that measurement in time units of seconds or minutes will result in under-exposure. With a light integrator one unit of radiation will always be one unit, even though the decrease in radiation from aging will result in longer exposures. I tested for consistency in printing multiples by making five contact prints of the Stouffer TP 45 step wedge on AZO #2 paper, using the same set-up described above for testing uniformity of illumination over the image area. The five test prints were developed together in Ansco 130 1:2. Once the prints were completely processed and dry I read the densities with an X-Rite 810, as before. The data, compiled in a table, is about as consistent as one could hope for and the very small differences observed are more likely the result of processing variations than to exposure. 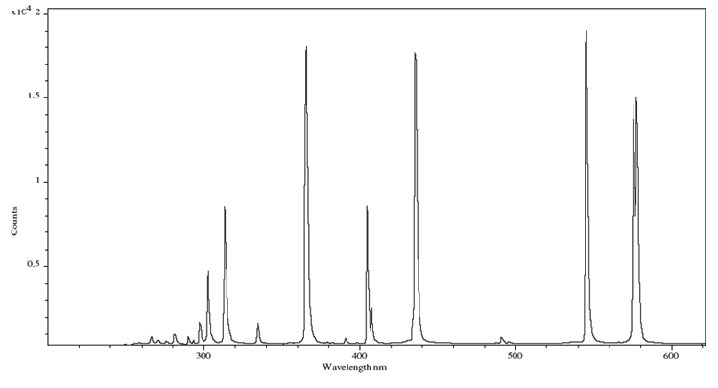 C. Tests to compare printing speed of the ULF-28 to that of a BL bank of fluorescents. The tests for printing speed were limited to alternative processes. Alternative printing processes are very slow, about 9 stops slower on average than contact speed printing papers such as AZO, and 15-18 stops slower than projection silver papers. Given the low sensitivity of alternative processes very long exposures are needed, in the minutes as a minimum, and up to an hour or more in worst case scenarios. For this test I compared the performance in printing speed of the ULF-28 to that of a bank of BL fluorescent tubes. I chose the bank of BL tubes because, 1) it is a light source that I personally use for printing with alternative processes, and 2) it is one of the most popular and common light sources being used today by other alterative printers. The BL tubes is also one of the most efficient tubes for printing with alternative processes, and in my own tests I have found it to print faster with Pt./Pd. than any other normal output tube. Just for the record, my bank of BL tubes consists of twelve 40 watt tubes, and the ballast is electronic. The tubes are relatively new, having been placed in the unit in March of this year, and at this time have less than a hundred hours of printing time. Based on numerous exchanges with other alternative printers I am fairly certain that the printing speed of my bank of BL tubes is quite typical of what one would expect from this type of UV light source. I did printing speed comparison tests of the ULF-28 and the bank of BL tubes with four different alternative processes, cyanotype, Vandyke, kallitype and palladium. The tests of each of these processes was carried out in similar conditions of temperature and relative humidity, using either COT 320 or Stonhenge Rising White. For the cyanotype tests I used COT 320, coating just once. The coated paper was allowed to air dry and exposed to a Stouffer TP 45 transmission step wedge. An exposure of 1600 units was used with the BL fluorescent bank, 400 units with the ULF-28. Processing was in water. When dry the step wedge prints were read with a densitometer and the curves plotted from the data with the WinPlotter program. 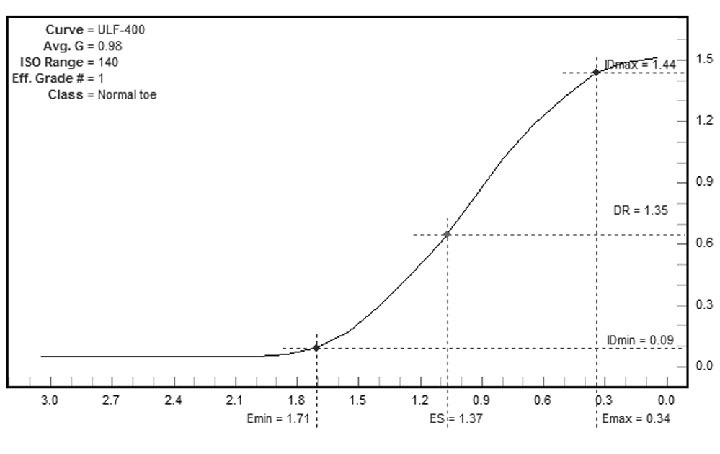 A quick look at the two curves shows that the ULF-28 prints cyanotype much faster than the bank of BL tubes. In spite of the fact that the exposure with the BL bank was twice as long as that of the ULF-28, the speed point of the BL curve is still about 2/3 of a stop slower than that of the ULF-28. In other words, the ULF-28 prints cyanotype almost three full stops faster than the bank of BL tubes. In other respects the two curves are quite similar. Both have a rather short, normal toe and a similar ES (exposure scale), log 1.37 for the ULF-28 and log 1.32 for the BL bank. Reflective Dmax is about the same with both light sources, not surprising since reflective density is more a factor of paper, chemicals and processing than light source. Cyanotype is by far the slowest of the popular alternative processes so if you compare the speed points of these curves with those of another process don’t be surprised by the big difference. The Vandyke tests were made on Stonhenge Rising White. The printing speed of this paper is slightly less than that of COT 320 with the iron processes so this should be kept in mind when comparing speed. The VDB test prints were single coated and dried for fifteen minutes before exposure. The BL print received 600 units of exposure, while the ULF-28 print was exposed for 200 units. The curves are below. It is immediately apparent that Vandyke is a very long scale process, well over log 2.0 with both the ULF-28 and BL. The plotting indicates that the BL print has slightly more contrast than the one made with the ULF-28, but the curves are quite similar. Taken into account the fact that the BL sample received 1.5 stops more exposure than the ULF-28 sample, and the difference in speed points of the plots, the ULF-28 prints Vandyke approximately 2 2/3 stops faster than the bank of BL tubes. The kallitype tests were made on COT 320. The paper was single coated and left to dry for 15 minutes prior to exposure . The ULF-28 print was exposed for 100 units, while the BL print received 400 units of exposure, and both prints were developed in a 20% solution of sodium citrate with 4ml of a 5% potassium dichromate solution added per liter of developer. Both curves are of the short toe type and are virtually identical in shape. The speed point of the ULF-28 print is about log 0.10 faster than the BL plot, which, combined with the 2.0 stops difference in exposure, makes the ULF-28 about 2 1/3 stops faster than the BL bank, in this condition. The curves are below. The palladium tests were made on COT 320. Both samples were single coated and air dried for fifteen minutes before exposure. Development was in a 25% solution of potassium oxalate, with 1ml of a 5% potassium dichromate solution added per liter of developer. One sample was exposed with the ULF-28 for 200 units, the other with the BL bank for 600 units. 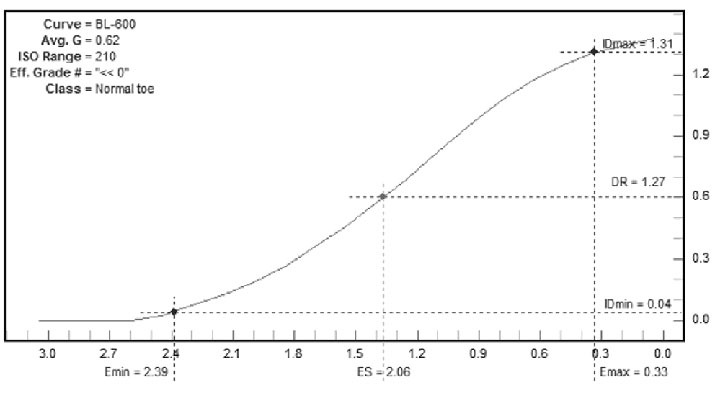 The ES is quite long for both samples, log 2.03 with the ULF-28, and log 1.96 with the BL source. 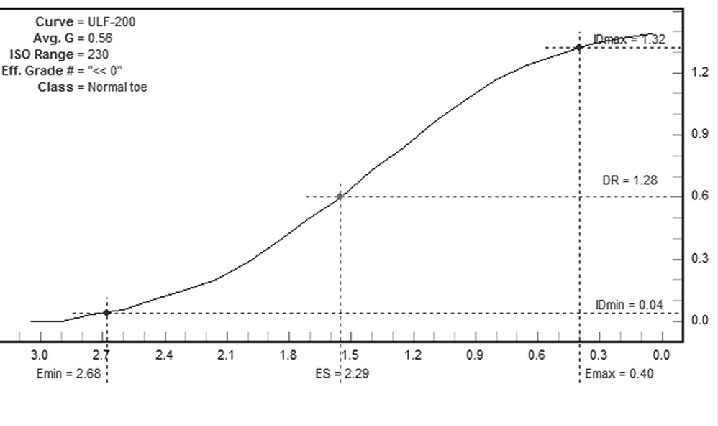 Considering initial exposure, and the speed points of the two samples on the curves, the ULF-28 printed about two stops faster than the BL bank in this test. The curve shape of the prints made by both light sources is characterized by a very long toe and a long shoulder, quite typical of palladium. 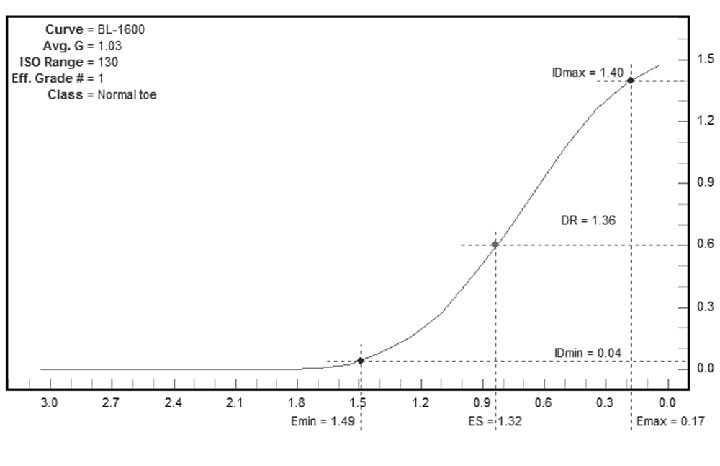 D. Role of the SPD characteristics of the CWX light source in determining print contrast and curve shape. 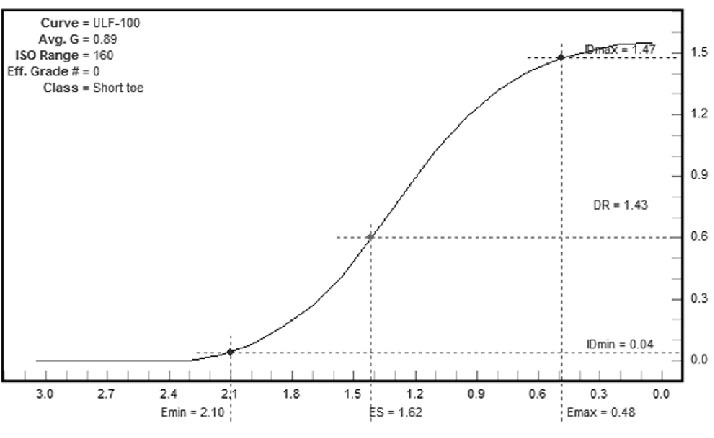 The SPD (spectral power distribution) chart of the mercury dose CWX bulb used in the ULF-28 is very similar to that of a BL tube. Both light sources have a very large spike at about 365 nm, another at 435 nm, and smaller spikes at about 405nm, 335nm and 324nm. The one major difference is that the spike at 435nm of the CWX is almost as high as the spike at 365nm, while the BL spike at 435nm is much lower. The SPD charts of the two light sources are reproduced below, first the CWX mercury dose bulb, followed by the BL. 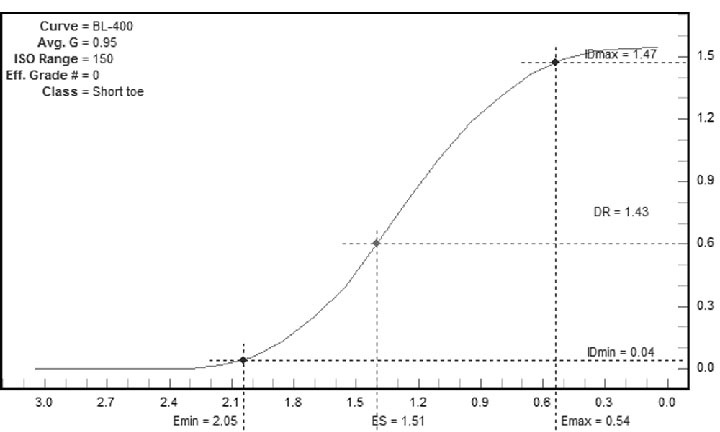 Based on the similar characteristics of the SPD charts of the CWX bulb and BL tubes one would expect very similar results in terms of print output in terms of contrast and curve shape, and that is indeed the case. 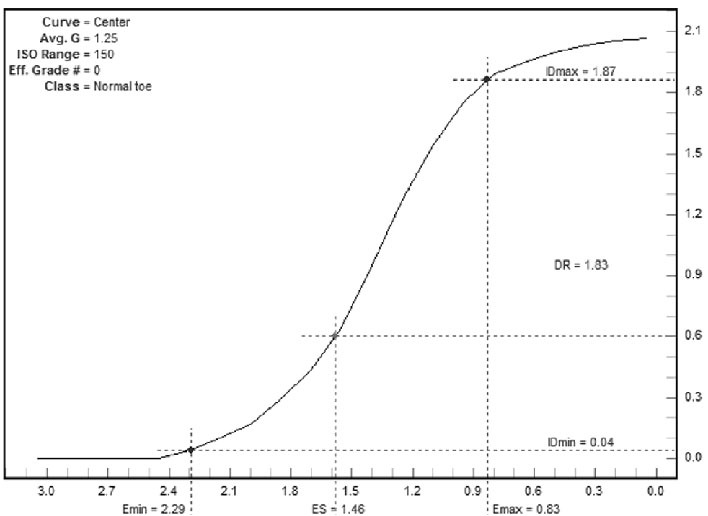 As we have already seen in the comparison curves of the alternative processes, i.e. cyanotype, kallitype, palladium, and Vandyke, both light sources print with almost identical contrast and curve shape. I also compared print curves on AZO with the ULF-28 and my regular printing light for this process, a 65 watt RD-40 flood placed at 36” from the printing frame. In order to attenuate the light to print on AZO I used the UV cut-off filter and three .9 neutral density filters. With this combination of filters, which cuts the light by about nine stops, the ULF printed about one stop slower than the RD-40. I could have balanced the results more closely with a different combination of ND filters, but I had the .9 filters on hand and went with them. The curves for the two light sources are reproduced below. 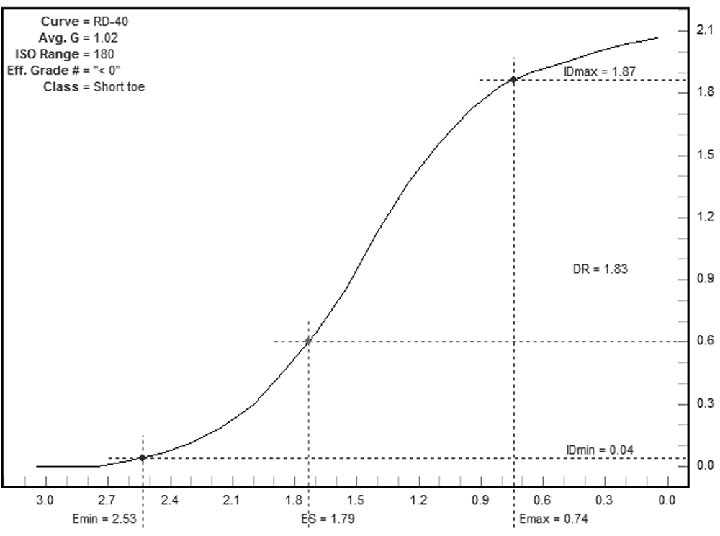 The curve of the print made with the R-40 light has a long toe and shoulder, while the one made with the ULF-28 has much shorter toe that we would characterize as normal, and the curve is also much more straight line in the highlights. 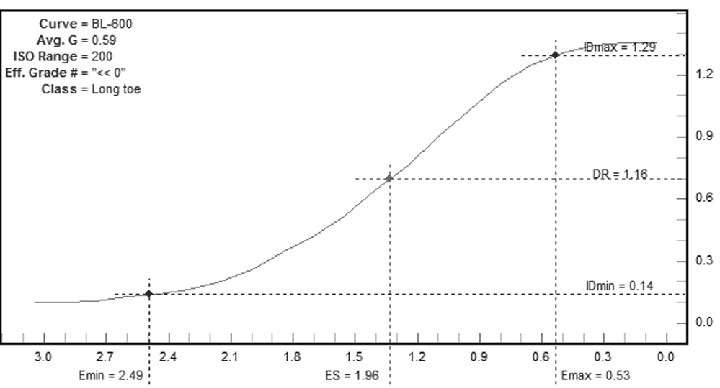 This two things together result in an ES in the ULF-28 print of log 1.54, and an ES of 1.79 in the print made with the RD-40. 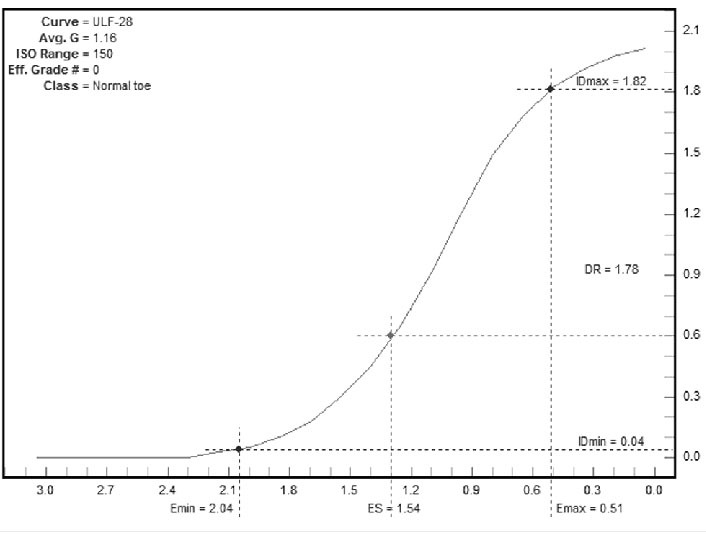 Since many people find the very long ES of AZO 2 to be a disadvantage the higher contrast provided by the ULF-28 is a very positive factor. The ULF-28 is also the most versatile exposing unit on the market for photographic processes. With appropriate options the ULF-28 can also be used for printing with both contact speed silver gelatin papers, such as AZO, and with projection speed silver gelatin papers, as well as with UV sensitive processes. In addition to printing speed, the ULF-28 also gives outstanding quality in evenness of illumination over the entire field, and in consistency with multiple exposures. For example, our tests show that fall-off from the center of the printing area to the far corners is only slightly more than 1/3 of a stop. This demonstrates excellent technology in distributing the light. The ULF-28 also excels in consistency, a highly desirable characteristics when one needs to made editions. To conclude, the ULF-28 is a first class exposing system that can be used with many photographic processes. It is well -built, incorporates the latest technology in lighting and integration systems, and should provide the user many, many years of outstanding service.